So after a long hiatus from football discussion, with basketball out of the way, let's get into it. Elijah Fields, who was dismissed from Pitt's football team last month for violating team rules, might end up at California University. Head coach John Luckhardt said Fields has shown interest in transferring to the university. The 6-2, 225-pound safety would have one season of eligibility remaining. "Everything is still in the processing stage," Luckhardt said. As much as he botched his chances at Pitt, I still try to convince myself that he's young and still learning. I hope he can turn things around there. Paul Zeise of the PG thinks that while Tino Sunseri had the first crack at reps with the first team, that Pat Bostick seems to have the slight edge in terms of knowing the system. It's been documented that Coach Wannstedt would like this battle to be settled this Spring. I don't know - with the way last year's competition went on, I'd be kind of surprised if that happened. Both quarterbacks say they're ready. 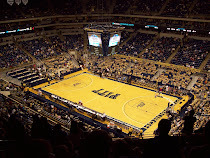 ESPN.com blogger, Brian Bennett, goes over the usual questions in his Pitt spring preview video. 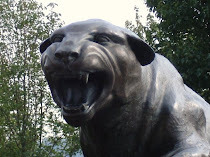 He also talks to Offensive Coordinator, Frank Cignetti, about Pitt's many offensive weapons. SI.com wonders if Pitt is ready to dethrone Cincinnati. More Pitt-Cincinnati talk. Everything I've heard this offseason has been about Pitt and Cincinnati. I'm a little surprised that it appears West Virginia isn't even being passively seen as a contender with both Jock Sanders and Noel Devine coming back. Cam Saddler's opportunity to get on the field more comes - at wide receiver: I really think he could turn into a great kick returner and hope his focus remains there. But with the losses of Oderick Turner and Dorin Dickerson, there's definitely a need there for another receiver. Stull, who was one of 15 former Panthers who worked out Tuesday for scouts representing 27 of the 32 NFL teams, is considered a late-round draft pick or a desired free agent. After the year he had, I'm a little surprised there hasn't been more discussion about him as a middle-round draft pick. He has experience in a pro system, made very few mistakes last year, and despite his weaknesses such as throwing an accurate deep ball, makes for a reasonable NFL prospect. Meanwhile, speaking of Dickerson, he's having a hard time gauging where he might be selected because of all the interest he's received.